The most common adverse reactions (≥20%) in the OlympiAD trial of patients who received LYNPARZA were nausea (58%), anemia (40%), fatigue (including asthenia) (37%), vomiting (30%), neutropenia (27%), respiratory tract infection (27%), leukopenia (25%), diarrhea (21%) and headache (20%). The percentage of patients who discontinued treatment in the LYNPARZA arm was 5% compared to the chemotherapy arm which was 8%. Please see Important Safety Information below. Under the oncology collaboration with Merck, announced in July 2017, AstraZeneca is potentially eligible for more than $6 billion of future Sustainable and Ongoing Externalization Revenue in the form of sales-related and approval-related payments in addition to option payments until 2019. Following this new approval for LYNPARZA, AstraZeneca will receive $70 million in Sustainable and Ongoing Externalization Revenue. 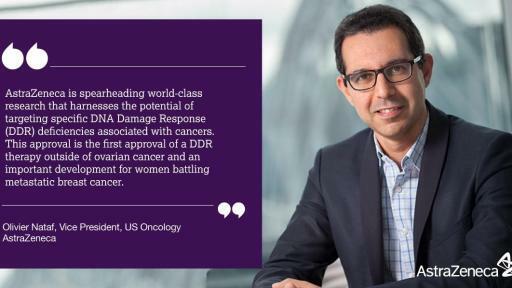 In July 2017, AstraZeneca and Merck (known as MSD outside the United States and Canada) announced a global strategic oncology collaboration to co-develop and co-commercialize LYNPARZA, the world’s first PARP inhibitor, and potential new medicine selumetinib, a MEK inhibitor, for multiple cancer types. The collaboration is based on increasing evidence that PARP and MEK inhibitors can be combined with PDL-1/PD-1 inhibitors for a range of tumor types. Working together, the companies will jointly develop LYNPARZA and selumetinib in combination with other potential new medicines and as a monotherapy. Independently, the companies will develop LYNPARZA and selumetinib in combination with their respective PD-L1 and PD-1 medicines. 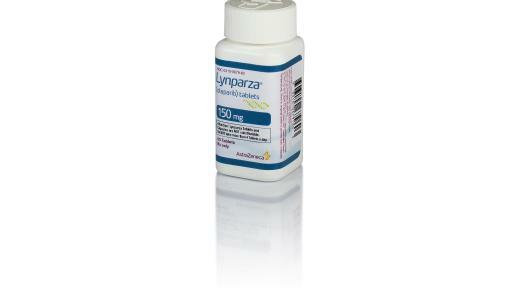 1 LYNPARZA (olaparib) Prescribing Information. Wilmington, DE: AstraZeneca; 2018. 2 Robson M, Im SA, Senkus E, et al. Olaparib for metastatic breast cancer in patients with a germline BRCA mutation. N Engl J Med. 2017; DOI: 10.1056/NEJMoa1706450. 3 Data on File, US-16345, AstraZeneca Pharmaceuticals LP. 4 US National Institutes of Health. Olaparib as Adjuvant Treatment in Patients With Germline BRCA Mutated High Risk HER2 Negative Primary Breast Cancer (OlympiA). Available Online. Accessed January 2018. 5 National Institutes of Health. Olaparib Maintenance Monotherapy in Patients with BRCA Mutated Ovarian Cancer Following First Line Platinum Based Chemotherapy. (SOLO-1) Available Online. Accessed January 2018. 6 US National Institutes of Health. Olaparib in gBRCA Mutated Pancreatic Cancer Whose Disease Has Not Progressed on First Line Platinum-Based Chemotherapy (POLO). Available Online. Accessed January 2018. 7 US National Institutes of Health. Study of Olaparib (Lynparza™) Versus Enzalutamide or Abiraterone Acetate in Men With Metastatic Castration-Resistant Prostate Cancer (PROfound Study). Available Online. Accessed January 2018. 8 US National Institutes of Health. 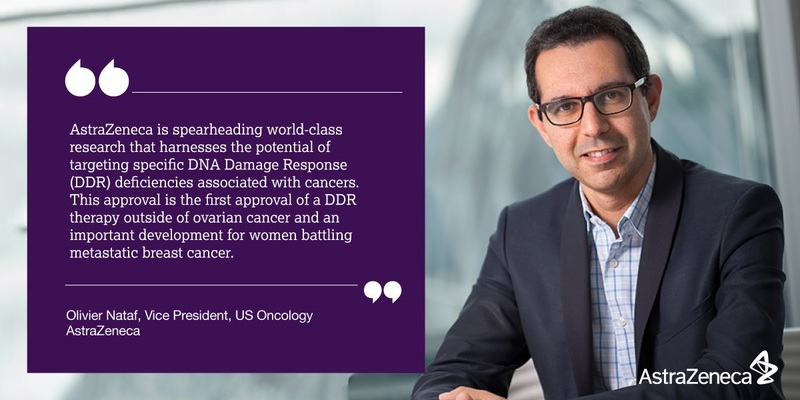 Assessment of the Efficacy and Safety of Olaparib Monotherapy Versus Physicians Choice Chemotherapy in the Treatment of Metastatic Breast Cancer Patients With Germline BRCA1/2 Mutations (OlympiAD). Available Online. Accessed January 2018. 9 American Cancer Society. Breast Cancer Hormone Receptor Status. Available Online. Accessed January 2018. 10 American Cancer Society. Breast Cancer HER2 Status. Available Online. Accessed January 2018. 11 Cleveland Clinic. Diseases and Conditions: Breast Cancer. Available Online. Last Updated September 5, 2013. Accessed January 2018. 12 Mayo Clinic. Breast Cancer Diagnosis. Available Online. Last Updated August 16, 2016. Accessed January 2018. 13 American Cancer Society. Breast Cancer Facts & Figures 2017-2018. Available Online. Accessed January 2018. 15 National Cancer Institute. SEER Cancer Fact Sheet: Female Breast Cancer. Available Online. Accessed January 2018. 16 O’Shaughnessy J. Extending survival with chemotherapy in metastatic breast cancer. The Oncologist. 2005;10(3):20–29. 17 CancerMPact.Khapps.com: ONC-Prevalence of Metastatic Breast Cancer in Women 2014-2020. Accessed January 2018. 18 National Cancer Institute. BRCA1 and BRCA2: Cancer Risk and Genetic Testing. Available Online. Accessed January 2018. 19 US Food and Drug Administration. 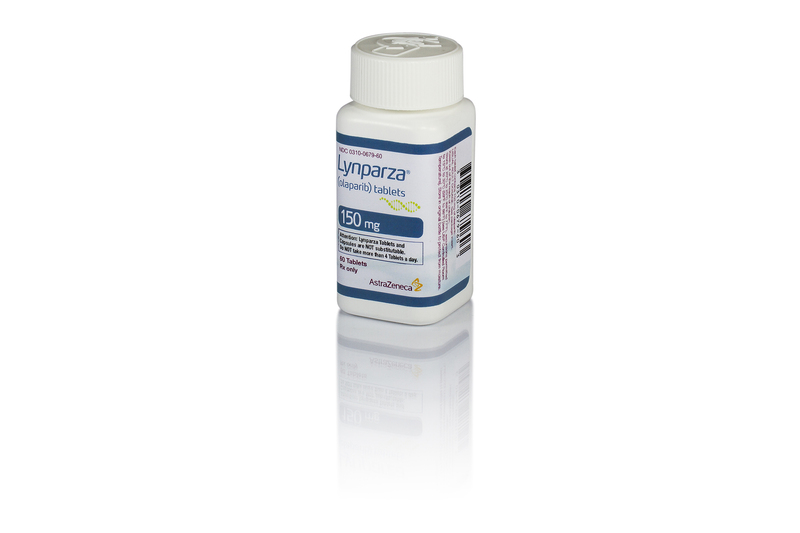 FDA approves Lynparza to treat advanced ovarian cancer. Accessed January 2018. 20 O’Connor M. Targeting the DNA damage response in cancer. Mol Cell. 2015; 60:547-560. Accessed January 2018. 21 Tutt AN, Lord CJ, McCabe N. Exploiting the DNA repair defect in BRCA mutant cells in the design of new therapeutic strategies for cancer. Cold Spring Harb Symp Quant Biol. 2005; 70:139-148.